The Library and Learning Commons Building turned 50 in February and its staff celebrated with cake and a video of the history of the building. The library opened Nov. 27, 1968, for students and faculty to use, and dedicated Feb. 5, 1969. It was open seven days a week: Monday-Thursday from 8 a.m.-4 p.m. and 6-9:30 p.m.; Friday from 8 am.-4 p.m.; Saturday and Sunday from 10 a.m.-3 p.m. According to the Jan. 12, 1969, edition of the Golden Eagle newspaper, “Many students will find that the library is a ‘must’ for procuring the materials which professors have on reserve. Also, it is a quiet and cheerful area in which to study as well as being a place where much material for recreational reading may be found. 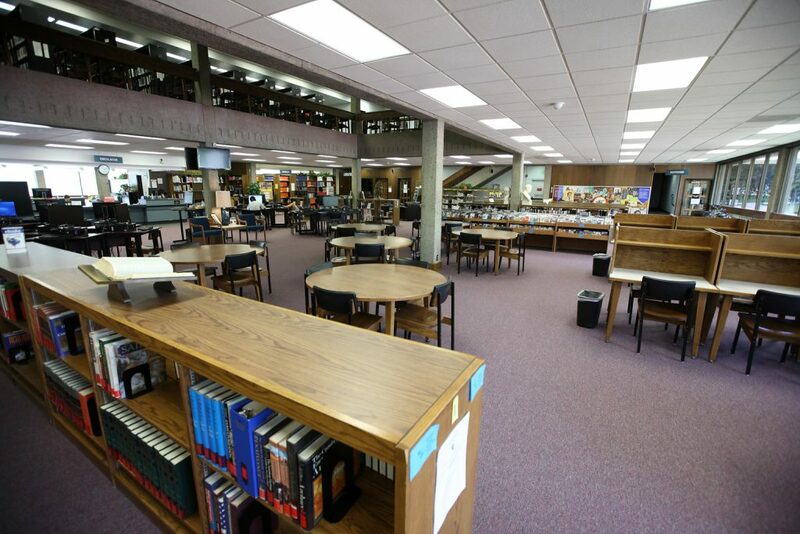 In a follow-up story, it was reported that Mrs. Verde was in charge of employing students to work in the library. Those students included Janet Thorpe, from Castle Gate; Marianne Allred, daughter of Mr. and Mrs. Sheldon Allred, both professors of Price; and Eileen Guyman, from Blanding. Kathleen Knight of Price, processed all books cataloged in the library. Herman Nava was a sophomore whose job was to pack the library mail every day from the temporary offices in the science building to the library. The paper reported Nava was married with two children. In 1969, Carbon County Mental Health Association donated “several hundred dollars” to purchase books for the CEU Library. “Mrs. Evelyn Roberts, director of the local welfare office and Dr. Joseph Salvatore, chair of the division of social studies, selected the books from a wide range of materials presently used in the study of mental health,” according to the Helper Journal. CEU’s Library was one of 10 Utah colleges to receive a portion of a $227,431 grant in June of that year. According to the Jan. 31, 1969 Golden Eagle, three of six new buildings were dedicated Feb. 5. First was the $525,000 library; second, the $350,00 dormitory; and third, the $200,000 administration building. CEU spent a couple of years under the governance of the University of Utah and John Tucker, Ph.D., served as its director. At the building’s dedication in ‘69, Utah Gov. Calvin Rampton gave the address while U of U President James Fletcher presented an honorary Doctor of Humane Letter degree to former Price resident Lee Hills, past publisher of the News-Advocate. Hills was the first person to receive an honorary degree by a branch of the U of U. Hills was one of the country’s foremost newspaper editors and executive editor of the Knight chain. He had spent more than 40 years on both directing and on the writing end of two Pulitzer Prizes.